Blake Griffin made his Detroit Pistons debut after being acquired from the Los Angeles Clippers in a trade. Griffin had to start the second half on the bench because he took off his warmup and realised he wasn’t wearing a jersey. Griffin did score 24 points in the 104-102 win. Blake Griffin made his highly anticipated debut with the Detroit Pistons on Thursday night, and while the night will certainly be a memorable one for him, he did momentarily forget something kind of important – his jersey. As the teams were preparing to start the second half, Griffin pulled off his warmup top only to discover that he was only wearing his Nike undershirt. Griffin had forgotten to put his jersey back on. Griffin quickly dispatched an equipment manager to retrieve the jersey in the locker room, but it was too late to start the second half. 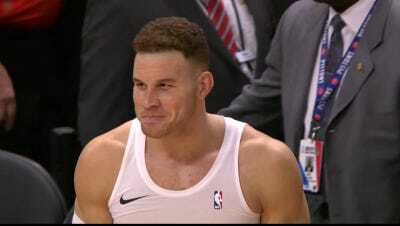 Griffin was left standing jerseyless and with an embarrassed look on his face as he had to start the second half on the bench. Yes, Blake, that is not great. Griffin did eventually get his jersey back and he went back into the game, still carrying a sheepish look. Griffin did lead the Pistons with 24 points in their 104-102 win over the Memphis Grizzlies. He also added 10 rebounds and 5 assists.